Yes I am using for the last 25 years ONE remedy maker. It is an old fashioned model from Magneto Geometric Applications, UK, a company still making the same machines firstly made by the radionic pioneer Malcom Rae. For other brands I cannot give any opinion, but for the one I am using (two simple dwells, input and output, to simulate remedies from a sample) I can assure you it works with only one objection: the output remedies work for not more than 3 weeks. BTW, I am an homeopath from Spain with no links with the manufacturer (I bought two in my life and I paid the huge price they ask for (huge after seeing the simplicity of the machine with a manufacturing cost of about 8% of the price in the market). Anyway it works and works well. Any remedies made by such methods and Offered For Sale are, per force, illegal. What you do in the privacy of your home is one thing, and what you do in your practice with your patients is another matter. Andre Saine did an experiment, what he found was, that the machine-created remedies did retain their information. I am investigating the use of the radionics device. I am interested in the model you have in the picture; who makes it? Recently on interhomeopathy a article wrote about making dynamic remedies with the help of radionics. I’m very skeptical, but also open-minded in some way, therefore I start to research what this radionics box have inside … really nothing beside some pseudo-functionality. But I thought if I would declare it as “bull….” then I would not be better than all the pseudoskeptics out there and it would be hypocrisy on my account if I believe in a idealistic world and quantum mechanics and biocentrism and holographic universe theory and so on, and despite this refuse radionics. Therefore I decided to build one, very simple, and guess what, it works!!! The technique involved is very simple: I take a photo collage of different pictures of the source. I tried LSD, because my intent was to take something which generates clear symptoms in a self proving. The photo is streamed by a Processing software to a Arduino (microcontroller) to some LEDs and a Moebius coil (don’t forget the resistors) in series. In the center of the Moebius coil a plastic container with some uninformed globulis are placed. After that I could use the globulis to potentize with succussion in order to stabilize the morphic field, but this time I just took the remedies before sleeping. I got a lot of dreams, … I mean a lot and very vivid, with some clear pictures. The themes of the dreams was more like that of Secale cornutum than the pure LSD trips described in books. Besides the clear results I have obtained, I refuse to call it homeopathy. Why? Because it requires a lot more of proving of this “new remedy”. The operator of the radionics tune into a field which could be the original source of the remedy, but it could also be just the abstract idea of the remedy. So only the classical approach with succussion and provings can provide certainty that the dynamic remedy can work. But we should experiment with it!!! As a trained but not formally qualified lay homoeopath, I’ve worked a lot with radionics over the past 30 years. I treat only myself and partner, the occasional friend and never charge for remedies since I am not qualified to do that. I have owned a Rae instrument and a plethora of cards which I re-sold years ago. Now I own a Prue made by a now deceased gentleman, Peter R, in Sydney, Australia. It can use Rae cards but it works well using his own design of an octagon with the remedy name written within the octagon. Works a treat. Like any remedy, it has to be the right one in the right potency. This instrument can do them all from LMs upwards. I was not able to photograph the progression at the time, but giving radionic Cortisone to a patient with the typical moon face and non-healing wound had astounding effects. Over the next 3 months, her legs shed layers of skin and the purple colouring gradually receded towards the toes. One dose of 6x, btw. A follow-up of radionic Cortisone 30 completed the cure. Right out of the textbook, brought to life the lectures on ‘direction of cure’. I use a radionic-made version of Biodynamic prepared 500 for a lot of different jobs. One is to keep kitchen scraps smelling sweet until they go into the compost. Use it when putting down a batch of compost. The red compost worms which live under the bins enter the mix at the right time for them and breed with enthusiasm. Then I use it in place of washing powder. The clothes come out with a brighter look to them and there is no substances in the washing water so the water can be used on the garden. I had heard that radionic-made remedies had a limited life. So far, 3 years down the track, the remedies which I have made including the BD 500, are still effective. I’m little sceptical about the efficacy of such a machine made potencies. I have been practicing for more than twenty years. I know if a remedy bottle is empty, just by keeping blank globules in the bottle they get medicated. but globules need to come into actual contact with the remedy or its remnants. If an exposure to the electro magnetic signals emitted by remedy can medicate, then why not keeping globules in the same room with the remedy can’t medicate ? Why not by just looking at the correct remedy (similimum) a patient can’t be cured ? these questions need to be examined and confirmation bias should be ruled out. I confess I can’t trust remedies made by radionics machines and would not dare try them in acute cases and emergencies. I have the machine that is in the picture, a Sulis Mk. 2. I also have a Sulis Mk.3 which I have used extensively for a number of years. It’s enabled me to make combination remedies which would be far too expensive to make otherwise by a pharmacy. I have made over 400 formula remedies over the years. I have probably the most effective homeopathic remedy in the world for Hay Fever. Surely that is proof that the Sulis machines work! I can’t say for any others. I know the most experienced Homeopath in our city of Sialkot-Pakistan, Dr Imran Sadrah is using a Magneto UK machine for over last 20 years and he swears by it. 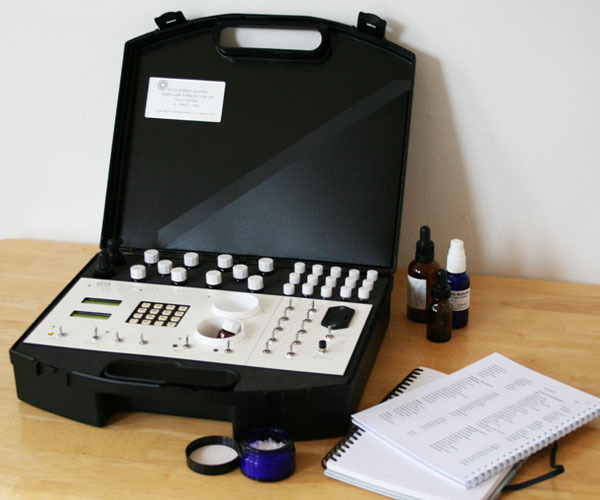 Treating 100s of patients every month with remedies made on his radionics machine, as a Homeopath myself, I have seen his patients cured, this must mean that radionics machines work well.